Tuesday October 21st 1890 We got ironing, baking and churning done today. I went to town the middle of the afternoon and stayed till late bed time. I was at the Methodist church a little while to see about renting a pew. Will went out to the west farm to fix up his corn crib. 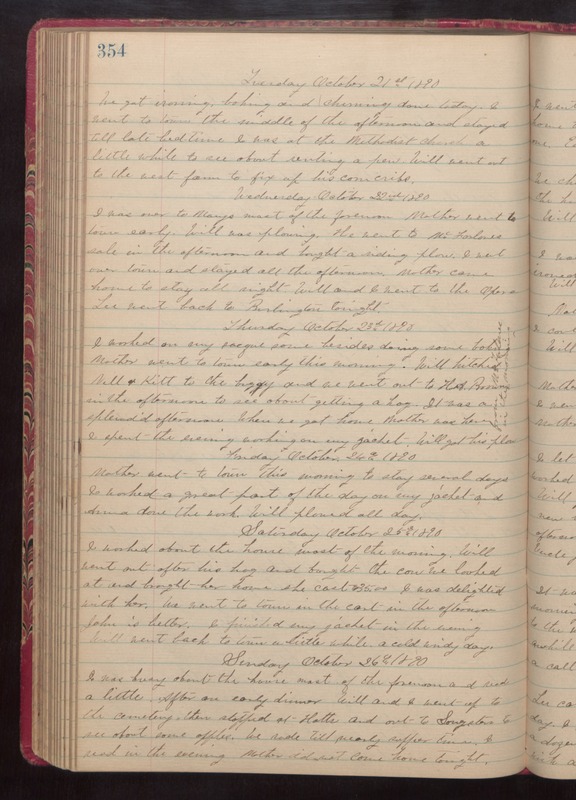 Wednesday October 22nd 1890 I was over to Marys most of the forenoon. Mother went to town early. Will was plowing. He went to McFarlanes sale in the afternoon and bought a riding plow. I went over town and stayed all the afternoon. Mother came home to stay all night. Will and I went to the Opera Lee went back to Burlington tonight. Thursday October 23rd 1890 I worked on my sacque some besides doing some baking. Mother went to town early this morning. Will hitched Nell & Kitt to the buggy and we went out to H. A. Browns in the afternoon to see about getting a hog. It was a splendid afternoon. When we got home Mother was here. I spent the evening working on my jacket. Will got his plow [the following text is written vertically in the right margin of the above entry]. from McFarlane in the morning. Friday October 24th 1890 Mother went to town this morning to stay several days. I worked a great part of the day on my jacket and Anna done the work. Will plowed all day. Saturday October 25th 1890 I worked about the house most of the morning. Will went out after his hog and bought the cow we looked at and brought her home. she cost $35.00. I was delighted with her. We went to town in the cart in the afternoon. John is better. I finished my jacket in the evening. Will went back to town a little while. a cold wondy day. Sunday October 26th 1890 I was busy about the house most of the forenoon and read a little. After an early dinner. Will and I went up to the cemetery, then stopped at Hatts and out to Songsters to see about some apples. We rode till nearly supper time. I read in the evening. Mother did not come home tonight.